Hollywood is a state of mind. In Los Angeles, that means living like a celebrity. It’s easy to do if you know where to stay and what to do. Here’s a beginner’s guide to get you started. Enter at your own risk. Swimming pools and movie stars. When you arrive, definitely stay at the Avalon Hotel in Beverly Hills. It’s as if time has stopped. Suddenly, it’s 1958’s “patio lifestyle” again with this gorgeously renovated hotel. Terrazo floors, sleek, low-slung furniture capture mid-century modern design at its best. The public spaces and rooms feature built custom-designed and classic furnishings including pieces by such notable designers as George Nelson, Isamu Noguchi, and Charles Eames. Pampering touches include custom-designed furnishings and beds with lavish Frette linens, Thymes amenities and in-room spa treatments. Anyone used to superb service anywhere in the world feels at home here. And the courtyard pool is perfect for a quick, refreshing swim before getting ready for dinner. Swimming with sharks is a way of life in Hollywood. 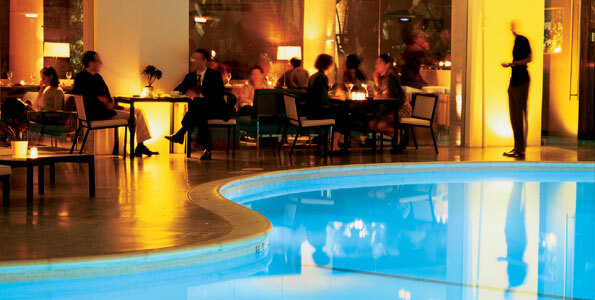 When you have a poolside restaurant as amazing as Blue on Blue on site at the Avalon, why go anywhere else? Private cabana dining is the best option. The innovative California cuisine is delicious and you’ll be surrounded by sleek starlets and their WB network teen dream boyfriends who litter the place on a nightly basis. More industry deals are done here than on the floor of the New York Stock Exchange. Floor to ceiling windows let in the night, but keep out the rest of the world. You could spend an entire evening there, but in a city that never slumbers, why would you? Humorist Oscar Levant once said that when you peel back the tinsel of Hollywood, you’ll find the more tinsel underneath. All that is golden really does glitter in L.A.’s thriving night scene. Hop over to Nic’s Martini Bar on Camden Drive, you’ll start your cocktail choo choo in style. Known for the best martinis this side of the Rockies, get tuned up with party fuel here first. Then onto Dulce, where Dean Martin’s spirit still burns brightly, swathed in gangster-inspired red leather booths. Dulce owner Ashton Kutcher eats there as often as he wears tracker caps. Afterward, jaunt over to nearby Koi – where the bar is the kind of place where you’ll run into Jessica Simpson and end up at Paris Hilton’s birthday celebration, if you’re not careful. So be careful – of yourself and the pesky paparazzi. 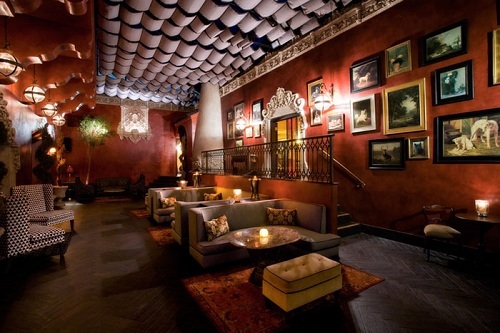 Then try out Club Prey on Sunset Boulevard - the place to be these days on Saturday nights. It’s design combines Asian bordello meets Oscar night party. All the swells gather here to toast their current three picture studio film deal. The entire place is dipped in red – from the red walls to the red candles that project perfect lighting on perfectly- precisioned patrons. And in the City of Angels, at night there are very few angels. L.A. closes down early, but when you want to find an after hours club, you can. Downtown near the new Standard Hotel, there are plenty. They change weekly, so be on the hunt for newly themed and newly exotic just-for-one-night clubs. For the entry fee of fifty bucks, you can play hard until the dawn arrives. Meet you there.